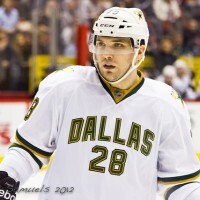 The Edmonton Oilers addressed an important need last week in dealing for defenceman Mark Fistric from the Dallas Stars. The Edmonton native is a tough, hard-nosed defenceman, something the Oilers are in need of. In return, the Oilers gave up a 2013 3rd round draft pick for his services. Surprising, seeing as though the Stars were somewhat thin on their depth chart to begin with. One of the biggest concerns for the Oilers and has been for the last few seasons is their defence. Specifically, toughness on the blue-line and being a harder, grittier group to play against. The group has already gotten a bit of a face lift this season with the much hyped signing of Justin Schultz, which will hopefully address their need for a puck-moving defenceman who can run the PP. Schultz will never be confused as a defence-first bruiser though. In fact, if anything with Schultz on the ice the defensive zone is potentially more suspect. In addition to Schultz, the top four defencemen on the roster currently are Ryan Whitney, Ladislav Smid, Jeff Petry and Nick Schultz. All four are good defensively to varying degrees, but none are particularly physical or intimidating to play against. They rely on good stick and body positioning and taking away time and space. Last year’s shutdown duo was Smid and Petry, who actually did a pretty good job. They can both skate, are good positionally and were effective against the other team’s top players. Although they aren’t the kind of D-men who you would exactly term mean or nasty or play with a significant edge. In terms of toughness Andy Sutton and Theo Peckham are the only ones that really fit the bill in terms of physical intimidation. The issue is that Sutton is facing a potentially career ending injury and Peckham is really only a depth defenceman and nursing an injury of his own. While he’s by no means a heavyweight enforcer, the Edmonton native brings size, toughness and a sound defensive game that opponents will have to be wary of. He is also an excellent penalty killer and will help considerably in that area. At 6’2” 233lbs he’s a big, physical presence and a heavy hitter who likes to lay out opponents. He’s not going to come in and log 30 minutes a night, and will likely still be a third pairing defenceman and the task of playing against the other team’s top line will still go to Smid and Petry. However, Fistric does present an upgrade on the third pairing from last year. He will make fewer mistakes than Peckham and is grittier and tougher than Corey Potter, the other two likely candidates to compete for the 6th spot on the depth chart. More importantly it should bring some added stability to the group as a whole. The top six to start the year could look like: Ladislav Smid, Jeff Petry, Ryan Whitney, Nick Schultz, Justin Schultz and Mark Fistric. The group of Corey Potter, Theo Peckham, Colten Tuebert and possibly Taylor Fedun will be in competition for the 6th and 7th spots. It may not be the top group in the league or have a Norris Trophy winner on it, but it is far more solid than last year and with the additions of Justin Schultz and Fistric, it is a step toward addressing the two deficiencies the group had the last few seasons, being the lack of puck-moving and toughness. Smid and Petry took significant steps forward in their development last season, and you know what you’re going to get from Nick Schultz game in and game out. If Whitney can stay somewhat healthy, the group could be good enough to help the Oilers compete for a playoff spot. Especially when you consider what kind of firepower they have up front. At just 26 years old, Fistric also has his best hockey ahead of him. On the last year of his contract, Oilers will no doubt be hoping Fistric plays his way into an extension. With many GM’s looking for similar types of defencemen, a third round pick is well worth a stalwart defenceman of Fistric’s skill set if he plays the same game Stars fans have been used to over the past few seasons.